Calusa and Mound House 289 Connecticut St.
Over two thousand years ago the native American Calusa Indians dominated most of the southwest region of Florida as they assembled in small villages or fishing stations, as the first inhabitants of these barrier islands. It is believed "Carlos" was the paramount chief to rule from his Mound Key, seen above, within the waters of Estero Bay. 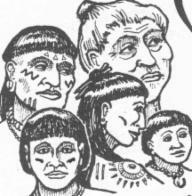 The Calusa were known as coastal people, and were "fisher-gatherers" whose sustainability depended on their rich and diverse habitat. They posessed a vast knowledge of seamanship, relying on tides and currents, and built seaworthy canoes and water courts with terraced mounds for higher and safer ground from high tides and hurricanes. Archeologists and historians continue to piece together the stories of these native people, who made first contact when Ponce de Leon explored this area in 1513. By the 1750's The Calusa had vacated these barrier islands, followed by the "fisherfolk", rumrunners and a pirate or two, who found refuge here. Estero Island was surveyed and platted in 1876. 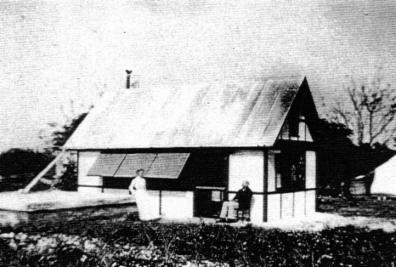 Robert Gilbert filed his claim in 1898 to build the oldest remaining structure on the island known today at the Mound House. 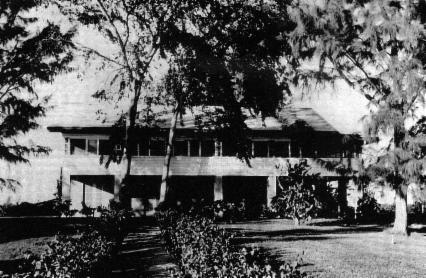 Built as a Tudor home, (above), with dock and cistern in 1906, it was known as the "Mound Villa", and in 1909, as the "Bungalow by the Banyan" when the brick structure was added. From 1914 to 1916 it was called the "Bayview" Post Offfice, when mail was delivered by boat. 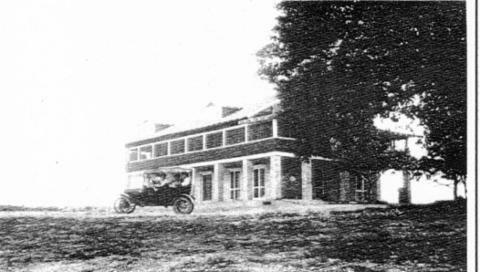 In 1921 the bungalow roof was remodeled and the bungalow named "Bayview Lodge". A garage was also constructed because cars were now arriving over the first toll bridge to the island where the beachfront was the only roadway, as seen below. During the WWII years the property served as an R&R facility for the military, and by 1947 the James Foundation established an experimental station as part of the WWII effort using the kitchen and garage. 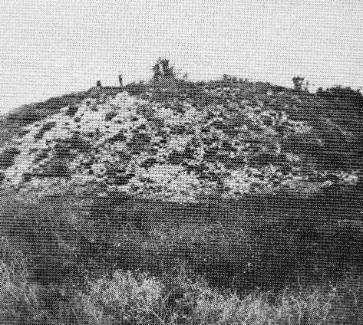 The mound was partially destroyed when new owners William and Florence Long purchased the property, which was then excavated to establish the "Shell Mound" subdvision. By 1958, a swimming pool and large Florida room was added with extensive landscaping. Known only as the "Long Estate", it served as a popular setting for fashion shows and club fundraisers on the Island. In later years the porch and side entrance were altered with a caregiver's addition. 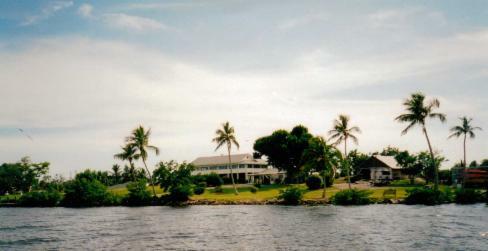 By 1995 the Town of Ft. Myers Beach incorporated, and the Mound House was obtained as its first preservation effort in saving the structure and site from being demolished and replaced by numerous villas and condos. Today this property is an archeological and historic site, and known as the "Cultural and Environmental Center". It is, indeed, "A Walk Through Time" as you visit the exhibit "Beneath Your Feet" and tour the grounds where Calusa first set foot to build a hamlet or fishing station on this once unspoiled back bay shoreline.